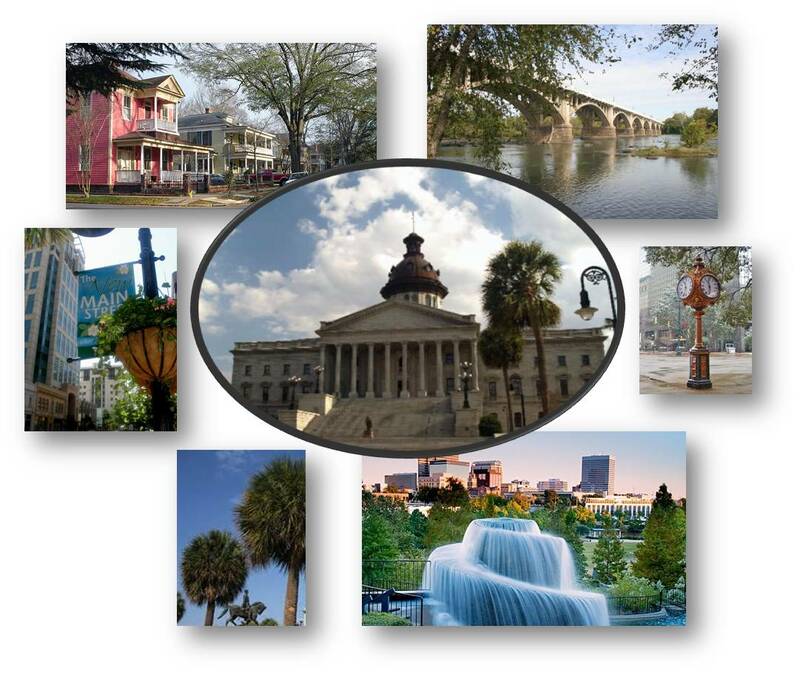 The city of Columbia, South Carolina includes far more than the State House and Main Street. Columbia is home to 129,272 people (2010 Census) and is the largest city in the state. While Columbia includes portions of both Richland and Lexington Counties, it is the county seat of Richland County, and is the primary city of the South Carolina Midlands area. The city is rich in culture, arts, cuisine, and history, and is nationally recognized for good things. According to CNNMoney.com, Columbia is one of America's 25 best places to retire, and is 6th on the U.S. News & World Report's America's Best Affordable Places to Retire. The city's central location between the Atlantic Ocean and the Blue Ridge Mountains gives residents and tourists alike the opportunity to rest comfortably while they visit their favorite coastal and mountain attractions during a single vacation! Interstates 26, 20, and 77 lead travelers from Columbia to Charleston, Myrtle Beach, Atlanta, Charlotte, Asheville, and virtually anywhere beyond. If you prefer to travel by air, the Columbia Metropolitan Airport is just 10-15 minutes away. With over 12 zip codes within 2 counties, Columbia, South Carolina includes urban, suburban, rural, and lake front properties, meeting just about anyone's preference. Columbia home prices range from low $20K to over $2Million, depending on the location, style, and size of the home and lot. There is virtually something for everyone here in "Famously Hot" Columbia, South Carolina. Columbia is home to the South Carolina State Museum and the Columbia Museum of Art , both of whom have hosted nationally acclaimed touring exhibits such as King Tut, Impressionist masters of art, and BodyWorlds Vital, just to name a few. Other major historical sites, art galleries, and several parks can also be found in Columbia. Finley Park is located in the heart of the city, and hosts several festivals, events, and concerts. The South Carolina Philharmonic Orchestra is also located in Columbia, as well as Riverbanks Zoo and Garden. Riverbanks is the most visited zoo in the United States, drawing visitors from all over the world.The Botanical Gardens have been recognized by HGTV as one of the 20 Great Public Gardens in America. Education is very important to the city of Columbia, home to several universities and colleges, such and the University of South Carolina, Columbia International University, Benedict College, Midlands Technical College, and others. In addition, many industrial research and technological campuses, the SC Criminal Justice Academy, and the SC Fire Academy are located in Columbia. One advantage of hosting major universities, as well as Fort Jackson, is the opportunity for the city's many restaurants to offer some of the tastiest local and regional flavors. Mac's On Main features Southern comfort food along with a good helping of Blues and Jazz, Rosso Trattoria Italia uses products from local farmers to produce "elegantly casual" cuisine, the Garden Bistro offers fresh and healthy foods, Blue Marlin Steaks and Seafood offers a complimentary bowls of collards with your meal (you just have to ask), and Little Pigs BBQ lets you fill your plate from its mouthwatering selections on the buffet line. If you are a visitor who's fallen in love with our fair city, or a Columbia native wanting to sell or purchase a new home, call Luz Bouleris today for true "Service Beyond The Sale!"